The following post is from site editor John Willingham. For years, U.S. News has used test scores and selection rates as ranking data for the annual “Best Colleges” report. The publication has slightly reduced the impact of test scores in recent editions. Our own work for the past eight years, however, shows that test scores do not have a similar correlation to quantitative assessments of honors programs. In our publications we list minimum and average admissions test scores for all programs we rate, but we do not count the scores alone as a rating factor. Here’s why we do not use test scores as a measure: The factors that make for an excellent honors program are primarily structural. The major building blocks are the credits required for honors completion; the number of honors class sections offered, by type and academic discipline; the availability of priority registration and honors housing; the size of honors class sections; and the number of staff to assist students. Admittedly, it is probably difficult for a student with, say, a 1050 SAT score to succeed in an elite college or in most honors programs. But within a fairly large range of SAT scores (~1280-1510), the opportunities for success are more often present given a conducive structure. With every biannual review of honors data, I find great pleasure in discovering outstanding honors programs that are not housed in highly- ranked and extremely selective universities. The golden nuggets of excellence in higher education are scattered much farther and wider than many would have us believe. I am strongly opposed to the numerical ranking of colleges or their honors programs, whether or not test scores are included in the methodology. I ranked honors program one time, in 2012, and regret doing so. Yes, I have data that allows me to numerically differentiate the total rating scores earned by honors programs. But anyone who wants to provide some kind of assessment of colleges or programs needs to do so with the assumption that their methodology is subjective and imperfect. Ordinal rankings based on distinctions of one point or fractions of a point give readers a veneer of certitude that a qualitative difference exists even if it (often) does not. Although we do not rank honors programs, we do place them in one of five rating groups, a process that is similar to rating films on a five-star basis but based on quantitative rather than completely subjective data. The seven honors programs in the top group in 2018 (out of 41) had average SAT scores (enrolled students) ranging from 1280 to 1490, a sizable range. Honors completion rates are something of an issue these days. An honors completion rate is the percentage of first year honors entrants who complete at least one honors program graduation requirement by the time of graduation from the university. 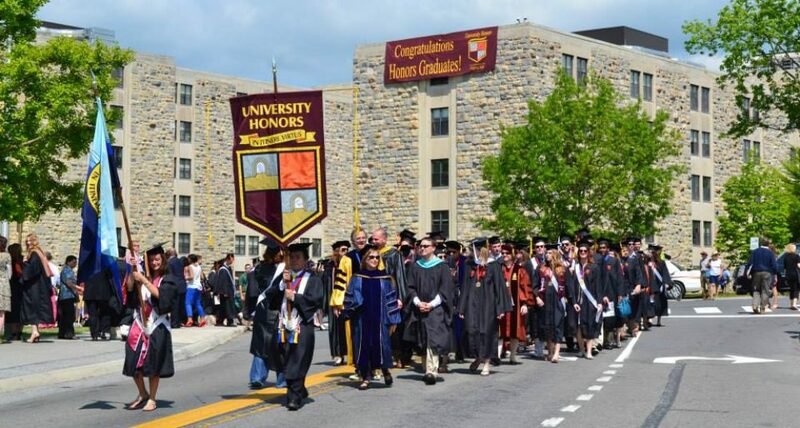 About 42 percent of honors students do not complete honors requirements before graduation, although a very high percentage of honors entrants (87 percent) do graduate from the university. The seven honors programs with honors completion rates of 75 percent or higher in our 2018 ratings had average SAT scores ranging from 1340 to 1510; the mean for this group was 1420. The mean SAT for the 31 (of 41) programs that provided completion rates was 1405, not much lower. And another seven programs with mean SAT scores of 1420 or higher had completion rates below 58 percent, the group mean. The mean SAT score for all 41 rated programs was 1407; the mean SAT for the top seven programs was only one point higher at 1408. It is clear, at least with respect to honors programs, that average SAT scores are not the best predictors of program effectiveness. What does this mean for the value of test scores nationwide, if anything? I think it means that for students who are in the 1280 to 1500 SAT range, success depends as much or more on mentoring, smaller interdisciplinary sections, student engagement, course availability, community (including housing), and advising support than it does on test scores. The good news here is that even for students who are not in honors programs, high levels of achievement are accessible to students who do not begin college with extremely high test scores, although non-honors students will probably have to assert themselves more in order to benefit from the strongest attributes of their university. New Coalition for Access and Affordability: A Revolution in Admissions? The Coalition for Access and Affordability is a new group of 80-plus colleges and universities, all with six-year grad rates of 70 percent and higher, and all apparently committed to transforming the admissions process at high-profile institutions. Among the members are all Ivy League schools, top liberal arts colleges, and many leading public universities. So far, the UC System and the UT System are not listed as members. Note: A link showing coalition members is at the end of this post. What exactly all of this means for the Common App is uncertain. For now, it appears that coalition members will use it. “What the emergence of a new rival might mean for the Common Application could become an intriguing storyline over the next few years,” the Chronicle of Higher Ed reports. The standardized admissions form used by more than 600 colleges worldwide has long dominated the college-admissions realm. As usual, Nancy Griesemer, writing for the Washington Examiner, has written an excellent post on the hot topic. “In a nutshell,” she writes, “the Coalition is developing a free platform of online college planning and application tools. The tools will include a digital portfolio, a collaboration platform, and an application portal. The planning site and portfolio portals are supposed to be open to high school students in January 2016, and the supposition is that coalition members will be using the data then. “Billed as a system designed to have students think more deeply about what they are learning or accomplishing in high school by the development of online portfolios, the new endeavor will actually create efficient ways for college admissions officers to access more detailed information about prospective applicants earlier in the game,” Griesemer writes. Here is a link showing coalition members as of this date. Honors News: August 20, 2015–Is Class Rank a Disappearing Metric? Of great importance to college applicants in some states (Texas, especially) high school class rank is of paramount importance. Texas high school grads ranked in the top 10% of their high school classes (top 7% at UT Austin for 2015) gain automatic acceptance to state schools, with UT Austin capping automatic admissions at 75% of the total freshman class. “It’s disappearing as a metric,” says Lee Coffin, a NACAC member and dean of undergraduate admissions at Tufts. NACAC reports that “a student’s grades in college-prep classes is considered the top factor in college admission decisions, followed by the strength of their curriculum, test scores and overall grade-point average, data show. “The shift away from class rank is related, in part, to the widespread adoption of weighted grades for students who take honors or advanced classes. Your scores on the ACT plus writing or the SAT reasoning test. These additional requirements go a long way toward ensuring that UC Berkeley students in the top 9% also have other credentials that point toward high academic achievement, especially success with rigorous courses (AP, etc). Using an automatic percentage as the basis for admission absent additional requirements that evaluate the real academic quality of high school courses is problematic. One reason is that it encourages some students to transfer to a high school with easier classes and less competition in order to improve class standing. Another reason is that the test scores of students admitted via automatic admission are somewhat lower; in the case of UT Austin, automatic admits averaged 28 on the ACT, while holistic admits had an average ACT of 30. Once again, The New Republic is featuring an article that discusses the pros and cons of an Ivy League education. This time, the article comes in the form of a review of New York Times columnist Frank Bruni’s new book, Where You Go Is Not Who You’ll Be. In the TNR review, called “It Doesn’t Matter if Your Kid Doesn’t Get into Harvard,” author Nick Romeo claims that Bruni is too focused on the ability of college grads from non-Ivy institutions to achieve material success on a par with Ivy grads. Romeo prefers the earlier challenge to Ivy education published in TNR: William Deresiewicz’s now famous article “Don’t Send Your Kid to the Ivy League,” which appeared on July 21, 2014, and has now been “shared” more than 200,000 times. Deresiewwicz’s article argues that many less elite schools, such as public flagships, allow bright students more latitude to discover themselves in the midst of fellow students who are not all driven or overly-focused on channeling their lives toward one thing: an Ivy admission. The fact is that college at its best is not an either/or proposition that pits learning for its own sake against training for a career. In almost every college in the nation there are at least three broad types of students–those who are in alive with self-discovery and intellectual excitement, those who want to get out in a hurry and find a high-paying job, and many others who are open to intellectual expansion but are acutely aware that the “real world” awaits. We see Bruni’s book as less an antidote than a balancing argument to the one proposed by Deresiewicz. While many smart “kids” do and should value intellectual stimulation, they and their parents need to be practical as well. If Bruni over-emphasizes the “antidote” of achieving career success equivalent to that of Ivy grads without attending an Ivy school, his message is one that parents and prospective students need to hear. As we have noted many times, there are far more bright students than there are places at Ivy institutions, and these bright students should be able to find, and should know that they can find, both intellectual and career equivalence at colleges outside the Ivy League, including public honors colleges and programs. It is well known that admission to any highly selective college can be capricious, subjective, and even approach the formulaic. Ivy colleges are wonderful, in most cases, for students who are both brilliant and fortunate. Students who are “merely” brilliant at one brief point of their lives need to know that the rest of their lives can be as fulfilling in all ways as the lives of their more fortunate counterparts.